(Note: The Hometown View did not air on WOBM Thursday so yes, there is a lot of the same material in both Thursday & Friday's segements). Well since Shawn & Sue are talking about uniforms today this segues nicely into the second week of the high school football season where the biggest game of the weekend finds Southern visiting Brick Memorial tonight. The Rams beat Pinelands in their opener with Memorial scoring an impressive win at Toms River East and tonight’s winner figures to pose the biggest challenge to pre-season favorite Toms River North in the American Division. Another good one tonight finds the East Raiders hosting Lacey, who will be without maybe their best player in Justin Pandorf, who suffered a knee injury last week and is out a few weeks. Our Shore Sports Network, including 1160AM will broadcast tonight’s Southern-Memorial game as well as the Saturday afternoon contest featuring Point Boro and Manasquan. at their 25th Annual Award Luncheon next Wednesday (Sept. 24th) at Woodlake Country Club in Lakewood. 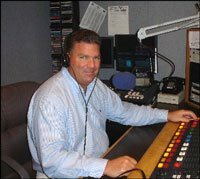 Novy is a well known attorney in Ocean County who gives time to numerous organizations and also hosts “Inside the Law” on 1160 WOBM AM. Waldron is the executive director of the Monmouth-Ocean Development Council (MODC) which is dedicated to enhancing the quality of life and business in the two counties. (800) 785-2090, x223. I was honored by the Girl Scouts in 2001 and the luncheon is a first-class event which supports scouting and its mission in our area. Congratulations to both Bob & Ben, truly worthy of the honor. Manchester Township Police Department PBA #246, the Manchester Little League and Ocean County Sheriff’s Department PBA #379 will hold 4th Annual One-Pitch Softball Tournament and Family Fun Day on Saturday, September 27th at the Little League Complex on Route 571. “Just-A-Hit for Justine” will help offset medical bills and other expenses incurred by the family of Justine Applegate in her battle against Pulmonary Hypertension. Teams that would like to register can call Rich Zingaro at (732) 779-3022. Gifts and other donations are also being accepted.